The software product DiffEngineX does not just compare the Excel worksheet cells, but it will additionally find the differences between the Excel VBA (Visual Basic for Applications) macros contained in two different Excel workbook files (xlsm or xls). Its VBA difference algorithm is a powerful one and will indicate when code has been moved up or down in a module or class by using the colors blue and gray respectively. Most diff algorithms inaccurately report text shifted about in a document as either a deletion or addition. Red is used for deletions and green for additions. DiffEngineX will report the differences between the Visual Basic macros in two different Excel workbooks without the need to purchase extra third party software, unlike some competing products. 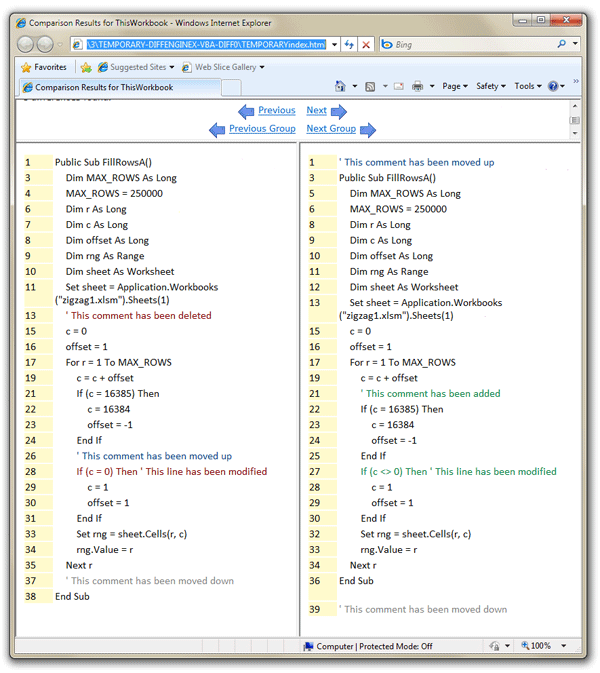 The VBA difference report is displayed in a web browser. Internet Explorer and Firefox are recommended for this purpose. Navigation of Visual Basic differences does not work when the report is viewed with Google Chrome. To compare Excel VBA code in two different Excel workbook files, you first need to open the Options dialog in DiffEngineX and check the Compare Visual Basic Code / Macros box. Then in Excel you must also do the following before using DiffEngineX to diff the VBA macro code. Then quit all open instances of DiffEngineX and Microsoft Excel. Note: xla and .xlam files must be converted to .xls and .xlsm files first before DiffEngineX can compare them. Click here for instructions on how to do this.